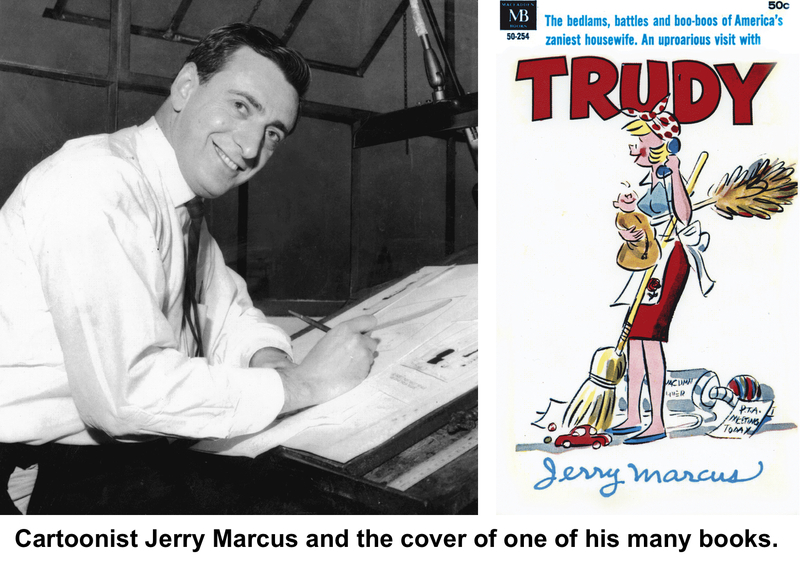 The cartoon was by Jerry Marcus, and soon it was hanging in the White House, the first of two to be so honored. 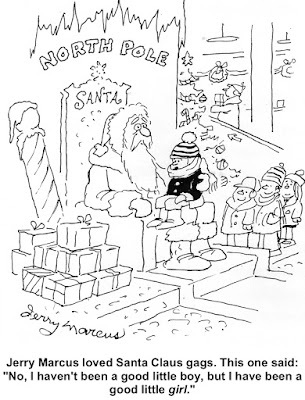 In the last half of the 20th Century, Marcus’s gag cartoons appeared in every major magazine, from The New Yorker to the Paris Match, and for many years, he was ranked among the top 10 magazine cartoonists in the country. 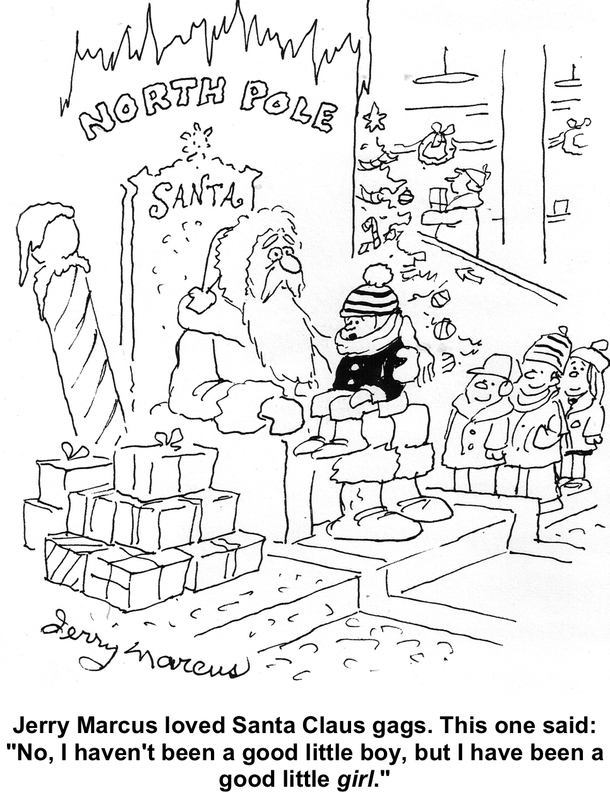 While most successful cartoonists stick to either magazine gags or newspaper strips, Marcus was successful at both. His King Features daily and Sunday strip, Trudy, appeared in more than 200 newspapers since it began in 1963, and focused on the life of a suburban homemaker — modeled, he said, a bit after his strong-willed mother who, as a young widow, had to raise four children in a cold-water flat in New York City. Marcus was born in 1924 in Brooklyn of immigrants from Austria-Hungary. His father died when he was three, and his mother, who had crippling arthritis, depended on welfare to help support her family. their room without knocking, and walk around looking for any signs that the welfare money had been improperly spent. One time, he said, the caseworker opened the icebox door, and found a half pint of ice cream that his mother had bought to celebrate one of the children’s birthdays. The woman scolded her for squandering taxpayer money on such a luxury. As a young boy, he knew he wanted to be a cartoonist. When he was still in grammar school, he sold his first cartoon for $2.50 to the School Bank News, a periodical published by a local bank for distribution to school children. When World War II broke out, he tried to join the Navy, but lacked the weight. Instead, he served in the Merchant Marine aboard aviation fuel tankers in the North Atlantic until he had built up enough weight to be accepted by the Navy. After a stint with the Seabees in the Philippines, he was discharged in 1946. After the war, he studied at the Cartoonists and Illustrators School in New York City. Almost immediately after his graduation in 1947, his cartoons began appearing in national magazines, including The New Yorker, Look, Saturday Evening Post, McCall's, and Ladies' Home Journal. More than a dozen books containing his work, including many Trudy collections, have been published. Hundreds of his cartoons have also appeared in his hometown newspaper, The Ridgefield Press, especially during the 1960s and 1970s when his work ran weekly. Marcus came to Ridgefield in 1956 and lived there more than 40 years before moving to Danbury and then to Waterbury. For many years he would often be seen walking along Main Street in the village with his friends, especially fellow cartoonist Orlando Busino of Ridgefield. Throughout his career, Marcus also did work with advertising agencies, and his series of cartoons for American Airlines was considered a classic. He often appeared with fellow cartoonists in programs at schools and libraries in the area, and at VA hospitals. He made several trips to Europe and the Far East with other cartoonists, visiting veterans hospitals where they would draw caricatures of the hospitalized veterans and entertain them with comic routines. Cartooning wasn’t his only “career.” Marcus, who’d acted in high school, was proud of the fact that he had a bit part in “Exodus,” the 1960 Otto Preminger movie, as well as in other movies including “Loving” with George Segal and Eva Marie Saint. He also starred in a number of commercials, such as for Timex, Burger King and Kodak, and he had been a member of the Screen Actors Guild since 1970 when he did his first commercial. Marcus died in July 2005. His former wife, WMNR radio broadcaster Delphine Marcus, had died just two months earlier. The second Marcus cartoon to hang in the White House appeared in the Saturday Evening Post in 1961, just after the Kennedys had moved in and not long after “John-John” Kennedy was born. It showed two guards outside an otherwise darkened White House, with a single brightly lit window. “It’s probably the 2 o’clock feeding,” one guard says.